It's the time of year again when I should celebrate the existence of my blog. Yeah, its the 3rd blog anniversary of my blog on 5th January. And that calls for a celebration with my valuable readers s a token of gratitude and thanksgiving. Follow Alive n Kicking and Oriflame on Facebook. Share the giveaway on your Facebook timeline, tag both pages and your friends. 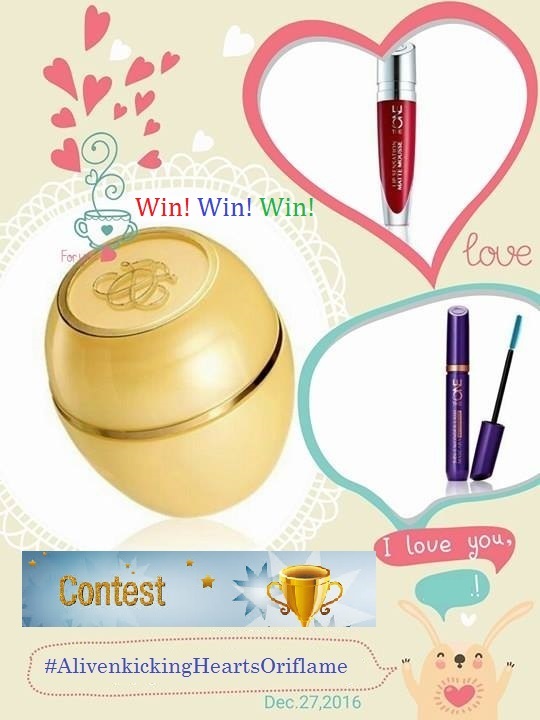 Follow Artisanme79 and oriflame_india on Twitter. Retweet the Giveaway, tag both pages and your friends. Follow ShilpaBindlish and OriflameIndia on Instagram. Repost the Giveaway, tag your friends and both pages. Subscribe to Shilpa Bindlish and Oriflame YouTube channels. Leave your profile name of FB, twitter, Instagram and YT in comment section including email address, else your entry won't qualify as valid. P.S. Brownie points to those who share and comment on blog posts during giveaway duration. Congratulations Harshita Chaudhary, Tanya Mittal, Gurjeet Chhabra and Sumita Kapoor for winning the awesome Oriflame hampers. Look for an email from us to claim your prizes. I swear by one the power shine lipstick from oriflame range because of its velvet touch,shiny and long lasting effect. Love to use oriflame product because they are skin friendly . hearty congratulations on completing 3 years.. many more to go... wish u all the success ahead. Thanks for this super giveaway..
will try my best in sharing it.. I swear by ORIFLAME THE ONE EVERLASTING FOUNDATION from oriflame product range becuase THIS GIVES THE PERFECT COVERAGE AND HELPS ME GET A SMOOTH AND SHINING BASE. iT ALSO HELPS E IN HIDING MY FLAWS GENTLY. Hope you see a lot of success ahead!! I Swear By The One Wonderliner from the Oriflame Range because it gives my eye makeup a perfect finish!! Biggest wish to win ! ! There is no denying in the fact that Oriflame is one of the most trusted beauty company selling direct in more than 60 countries worldwide. I swear Oriflame Milk & Honey Gold Moisturizing Hand Cream from Oriflame product range because it is a nourishing intensive care hand cream made up of Milk Proteins and Honey Extracts. It keeps my hands moisturized for a whole day and keeps my hand irresistibly soft and smooth. "I swear by Tender Care Protecting Lip Balm from Oriflame product range because it makes my lips super soft & smooth. And it keeps them hydrated for long hours.